six + seven = Required Please enter the correct value. A 60-year-old should have eight times their annual salary in savings to retire comfortably, according to Fidelity. But baby boomers simply aren't saving for retirement. Based on the U.S. median household income for 2016 of $54,000, pre-retirees should have $429,000 in savings by age 60. But according to a BlackRock survey, the average pre-retirement baby boomer (ages 55-65) only has $136,200 saved for retirement. Even more shocking, 55% of adults over the age of 55 claimed to have no retirement savings, according to a GoBankingRates research study. First, many baby boomers don't have enough money for retirement because they've lost a lot of the money they would have saved. During the dot-com bubble of 2000, the Nasdaq lost nearly $1 trillion in value from March 2000 to April 2000, according to Time. 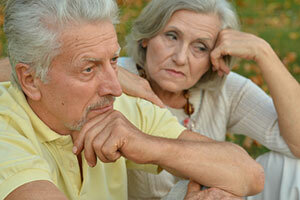 The financial crisis of 2008 and 2009 also wreaked havoc on retirement savings and wealth. Retirement accounts lost $3.4 trillion during the financial crisis, according to PBS. The second reason baby boomers don't have enough for retirement is many weren't able to grow their money. Because of the dot-com bubble and financial crisis, some baby boomers were afraid to play the stock market. And that means many missed out on stock market rebounds. For example, the Dow Jones Industrial Average opened at 13,261.82 on Jan. 2, 2008. On March 3, 2009, it opened at 6,765.50. In a little over a year, that's a drop of almost 50%. But investors who stayed in the market and bought stocks when prices were low have made massive returns. Today, the Dow opened at 19,968.97. That's a potential profit of 195% for an investor who invested in an index fund that tracks the Dow. The third reason is near-zero interest rates from banks made it much more difficult for baby boomers to grow their money before retirement. In 2003, you would have been considered lucky to earn 1% compared to today. Today, Bank of America Corp. (NYSE: BAC) only pays an interest rate of 0.01% for accounts with less than $50,000. Finally, the fourth reason baby boomers don't have enough saved is they are too reliant on Social Security to supplement their income. According to The New York Times, 36% of retirees rely on Social Security for 90% of their income as of January 2016. But it was only designed to supplement roughly 40% of pre-retirement wages. Relying on Social Security may have worked when FDR signed the Social Security Act in 1935. The average life expectancy was 63.9 years for females and was 59.9 years for males. But the average life expectancy today for females is 81.6 years and 76.9 years for males. Retirees are living longer and will need more money than previous generations after they stop working. Social Security alone won't be enough to cover medical bills and the rising price of goods under inflation. By 2037, Social Security funds are only expected to cover 76% of scheduled benefits. By 2089, only 73% of benefits will be paid out. There's an obscure clause in the U.S. Labor Code that could rob Americans of justified profits. This could cause a retirement blackout in 2017 and beyond. But there are little-known investment havens, like the 26(f) program, that give investors the opportunity to earn impressive monthly income on top of lump-sum payouts. Programs like 26(f) have been a well-kept "secret" of powerful government officials and politicians. Money Morning Chief Investment Strategist Keith Fitz-Gerald has been following this government scheme for years. Fitz-Gerald is a seasoned market analyst and professional trader with over 34 years of global experience – and he hates to see investors miss out on an opportunity. Even more, he hates to see the government profit at your expense. Fitz-Gerald has developed a short presentation that will show you how to take advantage of these 26(f) programs right now – exclusively for Money Morning readers. Click here to learn how to receive your free report.